The following companies have products which utilize or are compatible with Raveon’s GPS Transponders. Please review their products to see if it fits your particular needs. CES products are designed to offer real time vehicle data transfer with and without monthly service fees and compatible with most of the popular radio and wireless systems including Raveon’s M7 GX transponders, 2-way radios, radio trunking, satellite and cellular systems. CES Wireless offers pre-sale consultative services for larger projects, on site implementation services and project management, onsite or online product training, optional 24/7 support and integration to popular market specific CAD and Dispatch software systems. DataNet is a software product from DataLink Systems, Inc. DataNET Software is the result of eight years of evolution. It has been used by U.S. and Canadian Government Agencies for secure GPS tracking and IP packet data routing. The current version offers unsurpassed adaptability. Unlike ASP (Web Browser) software which ties the customer to a 3rd party server, DataNET is Client/Server based, allowing re-sellers to operate their own revenue generating hub or to sell to larger corporations and Government Agencies who want to operate their own private network. DataNet consists of an IP packet data routing “Server” hub called DataGATE which will link to SQL or other ODBC compatible DataBases and/or and one or more “Client” software programs such as “DataHOST” or other 3rd. party software which connect to the DataGATE hub over the Internet or Intranet. GPLocator by Dynamic Survey Solutions is an application capable of tracking up to 100 vehicles simultaneously in real time. It is part of the GPSeismic suite of software that fulfills the most demanding seismic survey requirements. GPLocator allows each vehicle to be configured with regard to its symbol type, color and label. Several serial and network communication protocols are supported, including interfaces for Raveon’s M7 series GPS transponders. There are logging and playback capabilities, and a utility that converts the log file into an MDB database and allows the user full query and reporting capabilities. Alerts include tests for proximity, exclusion zone, data age, and vehicle movement. See http://www.gpseismic.com for more information about this product. Global Mapper Software LLC designs, develops, and distributes the Global Mapper software package. They are committed to bringing powerful GIS software within the reach of everyday users by combining unparalleled ease of use with a vast feature set and an amazingly low price. With the release of v10.01 in late 2008, Global Mapper is compatible with Raveon’s My GX transponders. 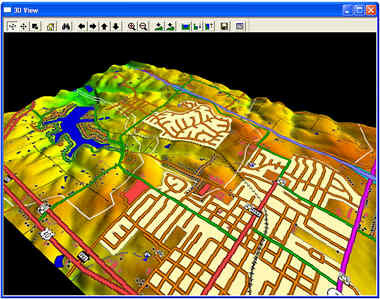 Global Mapper is more than just a utility; it has built in functionality for distance and area calculations, raster blending, feathering, spectral analysis and contrast adjustment, elevation querying, line of sight calculations, cut-and-fill volume calculations, as well as advanced capabilities like image rectification, contour generation from surface data, view shed analysis (including Fresnel) from surface data, terrain layer comparison (including differentiating), and triangulation and grid mapping of 3D point data. Repetitive tasks can be accomplished using the built in scripting language or comprehensive batch conversion functionality. Your data files can be loaded as layers, for example a Digital Elevation Model (DEM) can be loaded with a scanned topographical map to create a 3D view of the map. A digital aerial image can be draped on the surface together with vector contour mapping to create a stunning and informative graphic. The results can be printed, or the work space can be exported to a high resolution raster image for use in a presentation or report. GPSWOX is a web-app for tracking objects. Features include real-time tracking, notifications, history, alerts, geo-fencing, point of interest markers and you can even use a smartphone as one of the trackers. You can access GPSWOX from a computer, tablet or smartphone and it has a very modern look. The pages refresh quickly and the user interface is extremely intuitive. Gurtam offers a full featured web-app for visualizing tracked objects. With features like geo-fences, alerts and a host of settings, their web app has all of the functionality you would expect from a tracking application. You can view tracked objects on the map or in list form. MyDevices provides a software platform, Cayenne, to build your own IoT dashboard. This dashboard can be custom configured to show all of your devices on one screen and users can add their own graphs, buttons and various other feedback modules to show the state of their end-devices. With over 12 years’ experience in IT and Communications project development, SNCTechnologies has gained a reputation as a dynamic and forward looking team of professional engineers who design, develop, install, commission, train and support a vast range of world class communications, software, and electronic solutions for many types of businesses across the globe. SNCTechnologies’s main office and Network Operations Centre (NOC) are located in Balikpapan, East Kalimantan. In addition, it has a sales and engineering support office in Jakarta, a development center in Bandung, and support operations throughout Indonesia. The NOC monitors and controls the company’s microwave, fiber optic, and satellite and its vast Global GPS Tracking networks 24/7. In addition to providing satellite and internet services, SNCTechnologies has a full suite of fleet management and GPS tracking systems that increase productivity and improve management for oil, gas and mining, transportation, freight, shipping, cargo, plantation, and general businesses. These systems are developed at its best-in-class software and hardware development center. We have designed, installed, commissioned and maintained some of the world’s largest real-time MIMO and MESH based WiFi and VHF/UHF GPS tracking, voice and data networks for mission critical operations. We are a multi-skilled technology solutions provider. SNC Technologies is the technology section of SatNetCom. TracTrac (headquartered in Denmark) uses Raveon’s Atlas GPS radio to facilitate sailboat race tracking around the world. It’s comprehensive SaaS offering allows the visualization of races in real-time from any Internet enabled device.